Well, these pictures are not uploaded in any particular order, but here are some pictures from Mariah's Birthday party on the 16th. In this one, the kids are winding down, watching one of the Barney movies Mariah got for her birthday. There is Mason, Kenzie, Chantel, Emma and Mariah. We were trying to get Mariah to pose for her picture after she ate her cake and ice cream, but she was determined to "lose" the hat! Mariah love her "hat" book: The Cat in the Hat. 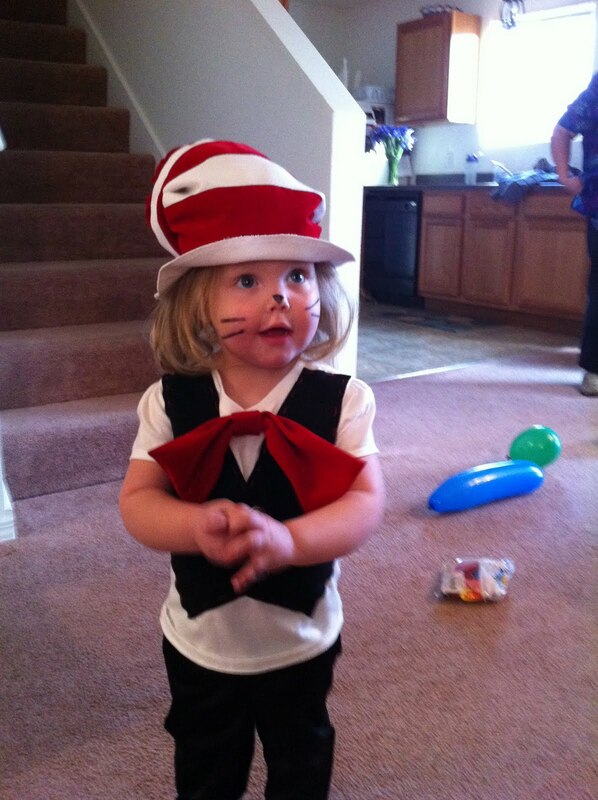 Her party theme was Dr. Seuss! This is the Cat in the Hat cake I made. It looked a little goofier than I wanted, but oh well. It is for a 2 yr old, right?! This is Heber's friend Randall with his daughter River. This is the best part of the party: when we broke the pinata! Channy has her Daddy's swing! We had an enjoyable party and enjoyed our visit from some of Mariah's favorite Dr Seuss characters! When Mariah saw them for the 1st time in the morning, she ran from one to another saying, "Hi Hat, Hi Socks!..." It was so cute!